Alkynes possess 2 pi bonds allowing for a full or partial reduction. 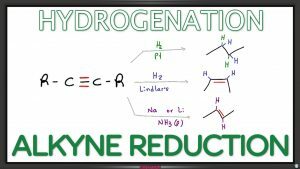 This video walks you through the conditions required for all 3 reduction products including complete hydrogenation as well as the partial reduction to a cis or trans alkene. You’ll also learn the step by step mechanism for (radical) dissolving metal reduction. This is Video 2 in the Alkyne Reactions Video Series. Click HERE for the entire series.